Many of you have already supported monkkee with a donation and we are grateful for every single contribution we receive, no matter how small or big. 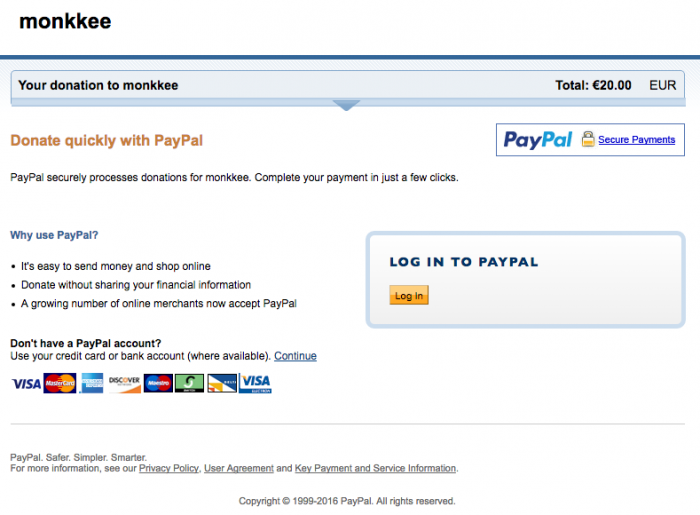 Your donations help us to keep monkkee alive and running and allow us to constantly improve your journaling experience. From here, you needed a PayPal account to continue. While it is true that many people have a PayPal account, it is certainly not everyone’s preferred payment method. We were often contacted by users willing to donate, but unable to do so without a PayPal account. This is why we have now implemented a new method of payment. At the bottom of the page, you’ll see a button called “Check Out as a Guest”. This will take you to a page where you can enter your credit card details. Try it out! The monkkee team greatly appreciates your support!! 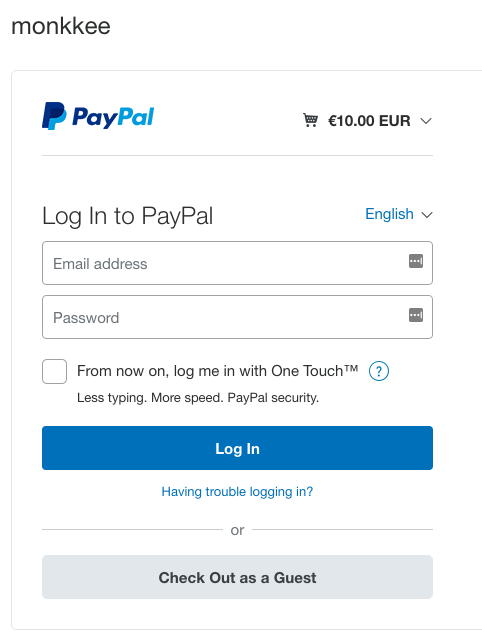 My credit card can’t be used with Paypal anymore. If I were to use your services only a daily basis, I certainly would make a small donation from time to time. Paypal is out for me. Wish you would offer a paid account. I really love ❤ this journal site. It’s very basic & simple to use without all that extra drama. Other diary/journals offer so much that at the end of the day they all like alike, plus, I don’t feel secure. The security and simplicity of this journal is why I stay here. My first journal was ***** only because I didn’t see this one first. Even though I feel secure with both, i like that I can manage the dates on monkkee.com, and the tabs, in ***** you have upgrade (go pro for a fee) to use these features. I Don’t want to see this site become the same ol’ same ol’ like all the rest. I like monkkee’s uniqueness. So I would like to donate, however isn’t there any way to donate via money order. That would work much better for me. I can manage that better and more regularly. Just saying. I really like that you guys give prompt responses. That says you guys really do care.